Home Tags Posts tagged with "Graffiti"
“The history of Australian hip-hop is firmly ingrained in the streets of Blacktown,” Mayor of Blacktown City, Councillor Stephen Bali said. In the 1990s, Blacktown was home to Western Sydney’s first artist-run initiative, Street Level, led by graduates from the University of Western Sydney (now Western Sydney University) and the College of Fine Arts. “The hip-hop movement in Australia, like that in America, was a form of expression by people outside the mainstream of fine arts and music,” Mr Gouriotis said. The exhibition includes performances, paintings, graffiti (both at the Centre and throughout the Blacktown CBD), video displays of female hip-hop performers from the 90s to now, and a rare original piece by visual artist Unique, last displayed in 1992. 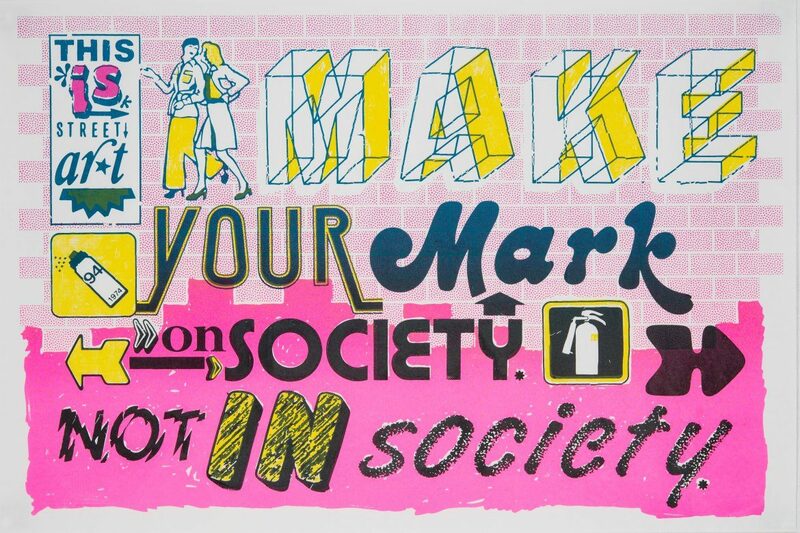 Mini Graff, Make Your Mark, screenprint on paper.